People can learn about the history of railroads and one historic depot in South Dakota during a program that will begin at 7 p.m. CDT on Tuesday, April 11, in the 1906 Fort Pierre Depot Museum. The foundation is the nonprofit fundraising partner of the South Dakota State Historical Society and is sponsoring the program with the cooperation of the Verendrye Museum in Fort Pierre. Everyone is welcome to attend the free program, made possible by a grant from the South Dakota Humanities Council, an affiliate of the National Endowment for the Humanities. Rick Mills will present the program “Yesterday and Today – Railroading in the Land of Infinite Variety.” He is a fifth generation resident of western South Dakota and a lifelong railroad enthusiast. He has been director of the South Dakota State Railroad Museum in Hill City since the museum opened in 2010. Mills has authored or co-authored books about railroad history and has been involved with programming for South Dakota Public Broadcasting, the History Channel and the Discovery Channel. Mills’ PowerPoint program on April 11 will feature images from some of his previous books on railroading, images from the museum’s collections, and previously unpublished images which will be used in the museum’s new book on state railroads, scheduled for publication in late 2017. Gary and Connie Grittner of Fort Pierre’s Bring it Home Committee will tell about efforts to bring the Fort Pierre depot back to Fort Pierre. 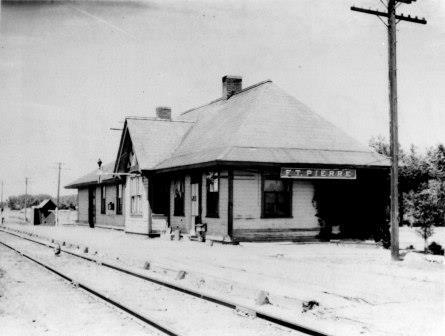 The Fort Pierre depot was built in 1906 and decommissioned in 1958. It was sold to Shirley Miller in 1963, moved to his Mud Butte ranch and used as storage. The Bring it Home Committee brought the depot home to Fort Pierre in 2013 in a location along U.S. Highway 83 and has since restored it. The book “South Dakota Railroads” by Mike Wiese and Tom Hayes will be available to purchase at the program. The book contains postcards and images of depots, trains and wrecks that defined South Dakota railroading in the early 20th century.